The “Chef – Professional Food Production” curriculum intends to create new chefs, that will combine productive and organizational abilities in order to be occupied in each and every category and type of food enterprise (Hotels, Restaurants, Catering, Cruise-Ships). The combination of laboratory and theoretical training refers to the excellent organization of the dish preparation, the coordination of the kitchen staff, the preparation of the menus, the organization of the supplies, the quality control and the proper conservation of raw materials, the supervision of hygiene and safety within the kitchen area. 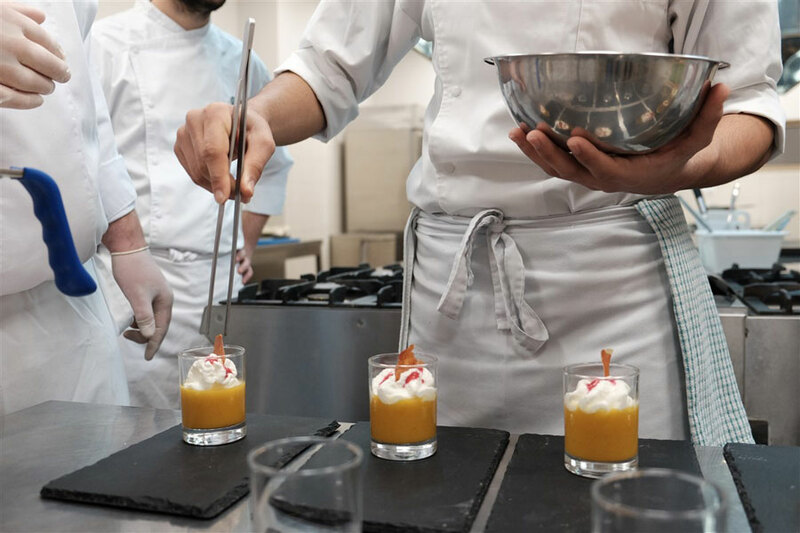 Young chefs are taught in depth, the Greek culinary tradition as well as the international cuisine, by blending theory with practice, so at to acquire the knowledge, perspective and skills they need to thrive in the hospitality industry. They periodically attend seminars by experts and top chefs from Greece and abroad, and organize educational visits to restaurants, hotels and catering establishments. The program provides internship in five and four star hotels and in distinguished restaurants, so that students become familiar with working conditions and enhance their curriculum with the necessary experience. LE MONDE Institute’s placement office, taking into consideration the academic performance of each student and in collaboration with almost 900 tourist enterprises in Greece and abroad, finds the best possible placement for all students who meet the prerequisites. The course lasts two years and course sessions begin every November and February. Lessons are reinforced by the specialized bibliography of LE MONDE Institute. Teaching is conducted by top chefs of the catering industry, while modern high-standard workshops, suitable for educational purposes are being used. Should have creativity and imagination, enjoy good food, varied flavors and everything related to food and its preparation.Previous cooking knowledge is not necessary as cooking for yourself or your beloved ones is not related to professional cooking. Candidates should have team spirit and enjoy the collaboration.Finally, they should emphasize on cleanliness and personal hygiene. Chef is one who can turn a basic need, such as food, into an artistic creation and a gastronomic delight. Surveys and studies present the profession of chef as one of the occupations most in demand in Greece for the next 10 years.